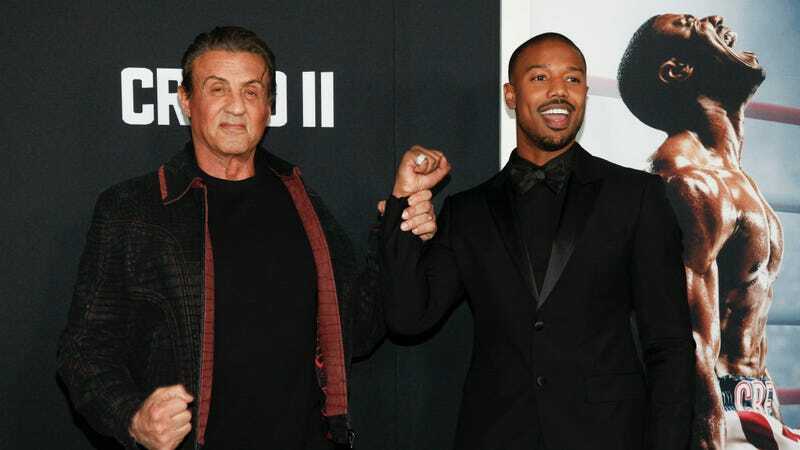 Sylvester Stallone, left, and Michael B. Jordan attend the world premiere of “Creed II” at the AMC Loews Lincoln Square on Wednesday, Nov. 14, 2018, in New York. If you thought an unending supply of reheated collard greens with a complimentary bout of The Itis would keep folks out of movie theaters this weekend you’re sadly mistaken. MGM, New Line, and Warner Bros. delivered a knockout over the holiday weekend with the Steven Caple Jr.-directed Creed II. With Ryan Coogler unable to helm Creed’s sequel due to his commitments in Wakanda, the latest installment of the Rocky franchise earned an astonishing $56 million during it’s opening weekend. For those keeping track at home, that’s the biggest debut ever for a live-action Thanksgiving holiday release. According to Forbes, $35 million of that was generated from Friday to Sunday while most of us where still drunk off of sweet potato pie. Of equal note, this is the biggest unadjusted debut ever for a Thanksgiving holiday release that isn’t affiliated with the House of Mouse. But it gets even better, because this is also the biggest unadjusted debut ever for a sports or boxing drama. Which of course means that this is the biggest debut ever for a Rocky movie. So kudos to all involved. Once this mac and cheese haze wears off I’ll be at the theaters with the rest of ya’ll.